Dutch painter and etcher. He was long confused with Jan le Ducq (1629/3076). In 1621 he was listed as an apprentice portrait painter in the records of the Utrecht Guild of St Luke. His teacher was probably Joost Cornelisz. Droochsloot (15861666). The St Job s Hospital in Utrecht acquired a Musical Company by him in 1629. By 163032 he was a master in the guild. 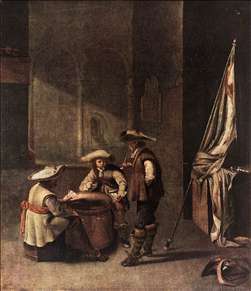 Like Pieter Codde, he painted guardroom scenes, in which the figures and their interactions are apparently full of underlying symbolic meaning. He also painted merry companies (e.g. 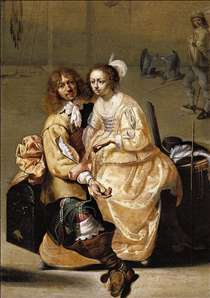 c. 1630; Nmes, Muse des Beaux-Arts) and domestic activities, such as Woman Ironing (Utrecht, Central Museum), employing motifs perhaps symbolic of domestic virtue. He placed his figures in high, bare interiors in which the deep local colours of the foreground stand out well against the cool, greyish-brown background. Only a few of his etchings are known, depicting figures in contemporary dress. Between 1631 and 1649 Duck s presence is documented in Utrecht, Haarlem and Wijk bij Duurstede. Afterwards, and probably by 1656, he was living in The Hague. He was buried at the monastery of St Mary Magdalene in Utrecht. See more details about "A Guardroom Interior"
See more details about "Guardroom with Soldiers Playing Cards"